Hey everyone, I've been sitting in the background using the search and just stalking all of you for a while now. The discussion of a bus has been going on for a long time between me and my younger brother for 15 years. We had no idea it was so popular! We're both Diesel fans/"decent" mechanics and absolutely wanted nothing to do with a gasser. 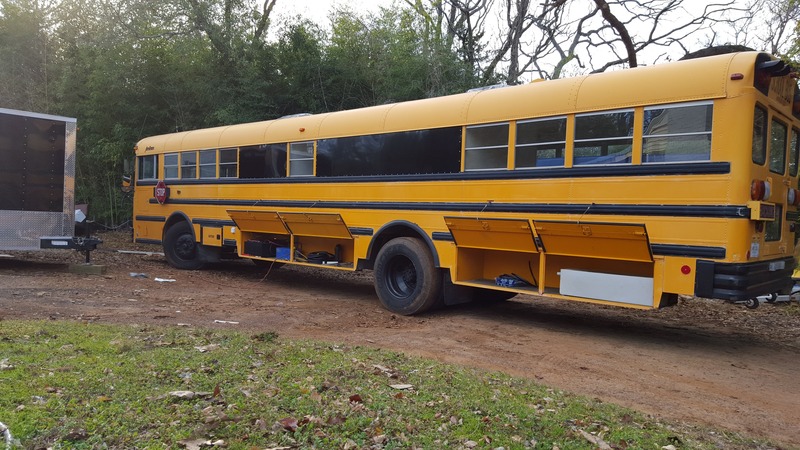 So we stumble on this ad in Houston Craigslist that seems a little high for a used bus, but when you’re pricing buses everyone has an opinion about what it’s worth. Just remember, it’s worth whatever you find valuable. Enter the 1996 International Amtran Genesis (As seen on the craigslist ad). Powered by the famous "mechanical" DT466 I6 diesel engine with only 77,000 miles, this "15 window" 40 footer built as a 90 passenger was a little steep at $5,000 and tires that looked like they were just put on in order to squeeze it off the lot. Here’s where the “worth” comes to play individually. This thing already had all but 4 seats removed, the motor was shiny, the electrical panels were shiny, oil was clear, and TONS of belly storage. the only thing I couldn’t tell was the type of transmission it had, either the MT545 or MT643. as soon as I drove it I knew it wasn’t the right transmission, but everything else was PERFECT. 1. Full 50 amp service, including a 3000 watt Aims inverter/Charger set up with 6 6volt Golf cart Lead Acid batteries. 2. two 100 watt solar panels and charge controller. 5. Two tv's wired together or separate with 12 speakers (4 on the back using the old safety light holes). 6. The old coolant heaters were left in the bus and built into the build and ducted to provide heat under way. 7. We swapped the Allison AT545 to a MT643 - yes we did. 9. Painted the bus with a satin Hot rod black at a body shop, painted the roof with elstomeric white. 11. Lighting is in three modes, (OFF)-PASSENGER SELECTABLE-(ALL ON) all controlled by the driver - it's a cool mod you should try. 12. Custom full size shower in the shape of home plate right in the middle of the bus for maximum height. I'm tired, you'll see more. I love electrical stuff and have done some unique things with water pump switching and lighting. After hours of research I stumbled across your comments here about the conversion from the AT545 to Allison MT643 I thank you for the in depth article for the swap this should make my swap easier. 5 is a little high for a 545 bus, but its a nice bus. I had one just like it. Was a 92 with a 466/643. They're highly regarded buses. Drivers LOVE them. The ride is a lot better than BB and Thomas I think.